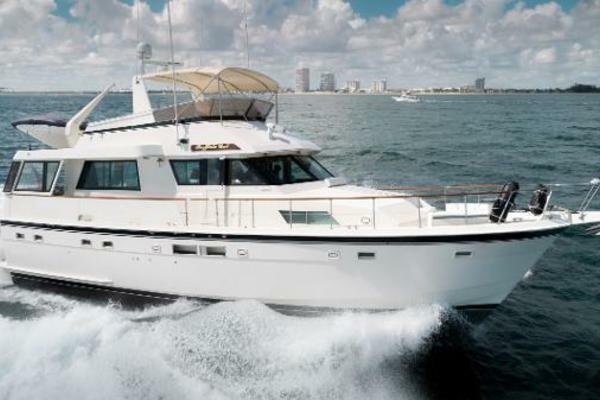 United Yacht Sales New Jersey would love to guide you through a personal showing of this 53' Hatteras Motoryacht 1973. This yacht for sale is located in Mobile, Alabama and priced at $120,000. For a showing please contact us by filling out the form on this page and we will get back to you shortly! Dingy– Boston Whaler with 15hp4 Fenders,Transom Platform,Navigational Lights,Aft Deck Enclosure,Hard Top over aft deck,Weather Cloths - seat covers,Bottom Paint - needs new paint - no blisters,Exterior carpet on aft deck,Danforth Anchor,Windshield - 3 wipers - 1 in center new,Aft deck furniture - built-in with table and chairs - white leather cushions,Enclosures - Aft deck - new with sun dodger aft,Half Tower Top - over flybridge with black sunbrella,Chocks,Davit - 1200 lb,Ideal Windlass - all chain,Radar Arch. 30 AMP - 110V - on each side,Dockside Cords,50 amp - 220 Volt - each side.